Vacker Environmental Engineering division has been providing solutions for monitoring and recording of every parameter for critical segments such as Refinery, Health care, Hospitals, Cold Chain, Shipping, Research, laboratory, pharmaceuticals etc. 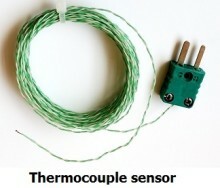 Various products being supplied us are temperature sensors, thermocouple sensors, temperature data logger etc. Also our services are Temperature mapping study, temperature qualification, thermal imaging etc. We have been providing our products and services especially for critical segments such as hospitals, pharmacies, cold storage, catering companies, hotels etc. The applications are for cold rooms, walk in chiller rooms, ware houses, refrigerators, freezers, deep freezers, furnaces etc. and for specialized areas such as research centers, laboratories etc. 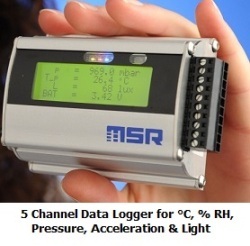 Chart recorders for recording various parameters such as Temperature, Pressure etc. on a paper chart and recent models on a LCD screen in electronic form. Real Time Web based monitors & recorders with Software for cold rooms, ware houses, chillers, refrigerators, deep freezers etc. Environmental Monitoring including those for meteorological purposes. 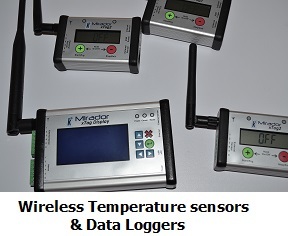 Wireless data loggers which transmits data through wireless modes such as WiFi, Radio Frequency (Rf), Blue Tooth etc. 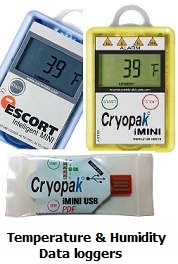 Cold Chain monitoring for vehicles, containers etc. RFID sensors with Radio Frequency identification tags mainly used for transportation purposes. Chemical monitoring for checking whether the chemical has been within the permitted levels throughout transportation and storage. Temperature Mapping study of ware houses, cold rooms, vehicles, panels etc. to study the effectiveness of the HVAC system throughout the entire covered area and to identify hot spots in the area. This is mainly carried out for Pharmaceutical and Food industry. 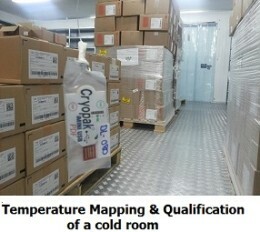 Temperature Qualification & Validation is a detailed study carried out for cold rooms, reefers, vehicles etc. to certify that they are suitable for transportation and storage of sensitive items such as medicines, vaccines, food, blood, body cells etc. Thermal Imaging for Machinery, Electrical equipment, Panels etc. is an analysis to identify potential faulty conditions for these equipment. Vacker has been a leading supplier of all such standard products and custom made products for transportation and storage of food, medicine, vaccine, chemicals etc. The climatic conditions in all the Middle East countries is extremely high in summer and adequate protective measures need to be taken to ensure that the goods are within the permitted levels. We provide entire range of services for the complete Cold Chain Management operations from Manufacture of the goods through transportation to the distribution. The Middle East countries import large volume of goods from around the world and such items pass through multiple climatic conditions before reaching the end user and it is extremely important that all critical parameters are recorded and monitored throughout the entire cycle. Vacker Presently operates directly and through associates in UAE, Kuwait, Oman, Qatar, Kingdom of Saudi Arabia, Jordan, Bahrain and Iraq. to offer tailor made services as per customer needs.